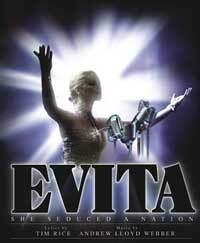 Bill Kenwright is taking Andrew Lloyd Webber & Tim Rice's Evita on the road again next year with the first announced date on 20th May 2013 at the Milton Keynes Theatre. The only venue which has booking open at the moment is Milton Keynes from 20th May-11th June, it is also touring to Glasgow Kings (3rd-15th June), Norwich Theatre Royal (15th-27th July) and Wolverhampton Grand (19th-31st August). More dates and casting to follow.